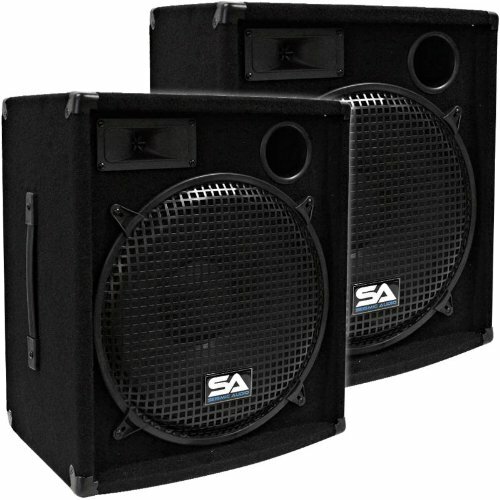 Pair of 15" Pro Audio Speakers - Model - SA-15.2 (Set of 2), Woofer - 15" and each has a 50 oz. magnet with a 2" voice coil, 300 Watts RMS - 600 Watts Peak, Wired at 8 ohms, 45Hz - 20KHz, Sensitivity: 96 db., 2x5 Tweeter, 5/8 plywood front panel, Steel grill over speaker, Side Handle, Terminal cup with two 1/4" inputs, Can be Daisy Chained, Mount cup for speaker stands, One port, 19" tall - 16" wide - 12" deep, Weight: 30 lbs per cabinet, These speakers are brand new, One year warranty. This listing is for a pair of these 15" speaker cabinets. You will receive two identical speaker cabinets, pictured and described above. Each speaker cabinet has the specs above. Best for small DJ's, small PA use, keyboards, vocals, studio monitors, churches and weddings. These speakers have an all around great sound.